Photo by Josh Hughes Parkersburg Catholic’s Aaliyah Brunny tracks a loose ball during a regular-season game against Charleston Catholic. 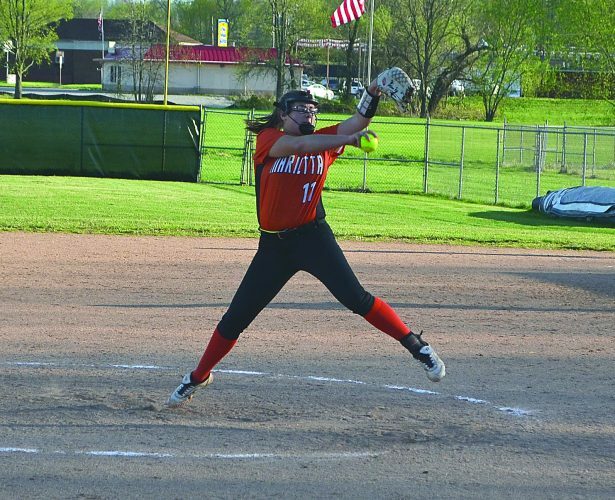 Brunny and teammate Madeline Huffman were named to the Class A All-State first team. 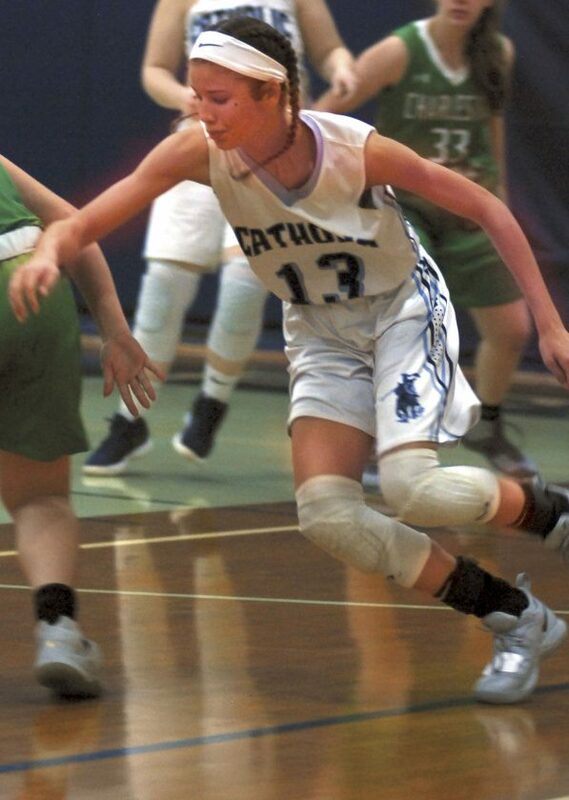 HUNTINGTON — A dozen years passed before Parkersburg Catholic’s girls basketball team earned the opportunity to play for the program’s tenth state title. Junior Madeline Huffman (15.7 points, 5.5 assists, 3.4 steals per game) and sophomore Aaliyah Brunny (16.5 points, 6.2 rebounds, 5.0 steals per game) had a lot to do with the Crusaderettes facing Huntington St. Joe in the Class A championship game earlier this month. The Irish though proved too much for PCHS in a 71-46 defeat. The duo’s efforts did not go unnoticed. 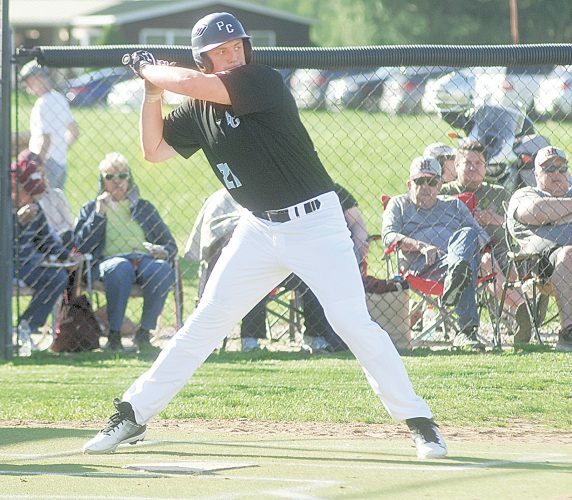 The West Virginia Sports Writers Association honored them as first-team honorees on the all-state team. As for the team who beat them in the title game, it appears that three is the favorite number of Huntington St. Joe’s girls basketball team. The Irish have built their winning tradition on utilizing talent and tempo, which enables them to get into transition and look for open 3-point looks for an array of shooters for head coach Shannon Lewis. In this year’s Class A Championship game, Lewis watched as Huntington St. Joe senior Paige Shy showed what that philosophy is all about in knocking down an all-classes record of eight 3-pointers en route to 28 points in the win over Parkersburg Catholic. Not only did Shy earn a spot alone in the record books and a state championship with the performance, but she joined Brunny and Huffman on the top team. Shy averaged 18.4 points and 5.5 rebounds per game while adding 2.6 steals and two assists per contest for the Irish, who finished the season 23-4 while being ranked as high as No. 22 nationally at one point this year. In keeping with Huntington St. Joe’s theme of ‘Three’, the Irish placed three players on the Class A first team. St. Joe senior Dena Jarrells (15.7 points, 3.7 assists, three rebounds, 2.5 steals) and junior Bailee Adkins (11.2 points, 5.4 assists, 4.2 steals, 4.1 rebounds) also joined Shy as first-team members. Wheeling Central’s Eden Gainer (18.4 points, 4.3 rebounds, 3.8 assists, 3.3 steals) and Trinity’s Reagan Sharp (16.8 points, 5.4 rebounds, 5.3 steals, 5.2 assists) were seniors who made the first-team while Summers County sophomore Gavin Pivont (20.8 points, 7.0 rebounds, 2.8 steals) rounded out the top eight selections. 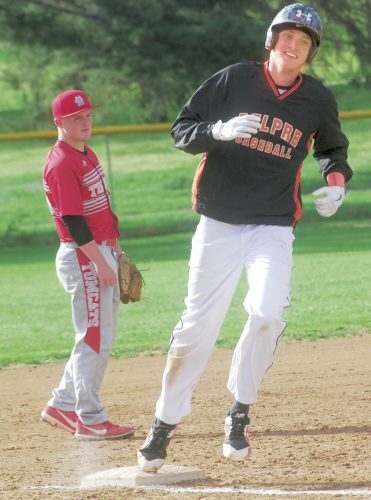 All eight players helped lead their team to the state tournament in Charleston this year. Tucker County junior Terra Kuhn was named as the captain of the second team after a year in which she averaged a double-double (14 points, 10 rebounds, 5.0 steals) while impacting the game in several ways. Many of the members of the Class A second team will return next season with only two seniors – Notre Dame’s Taylor Martino and Madonna’s Andrea Alimario – being featured out of eight selections. Martino averaged 17.2 points and 6.8 rebounds while Alimario averaged 16.4 points and 7.5 rebounds per outing. In addition to Kuhn, juniors on the team included Magnolia’s Kyndra Pilant (17.5 points, 17.3 rebounds, 3.2 blocks) and Wheeling Central’s Kaylee Reinbeau (15.8 points, 9.4 rebounds). Summers County’s Taylor Isaac (20.8 points, 3.5 assists, 3.3 steals) and Magnolia’s Mady Winters (23.1 points, 13.1 rebounds) were sophomores on the team while Parkersburg Catholic’s Leslie Huffman emerged as a strong, young talent within the state, averaging 12.6 points, 5.0 steals and 4.2 rebounds in helping the Crusaderettes to the title game. 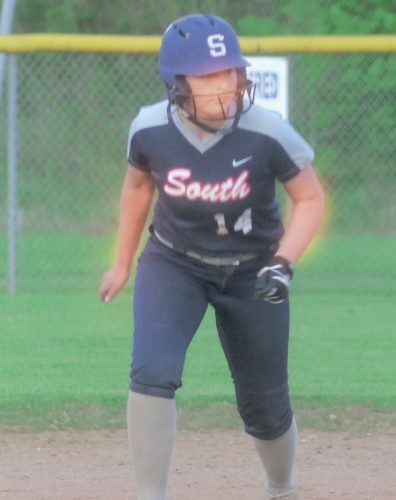 Midland Trail senior Jenny Wilson was named as captain of the senior-laden third team. Other seniors on the team include Tolsia’s Sarah Jude, Ritchie County’s Abi Haught, Sherman’s Deja Busby, Montcalm’s Savannah Bailey, Valley-Fayette’s Hannah Foster and Tyler Consolidated’s Josey Jones. The lone underclassman on the third team was Tug Valley’s Kaylea Baisden.